Today is the reveal date of these beautiful Chocolate Cornets as part of our Baking Eggless Group started by Gayathri. She gave us a recipe and guided us with a video on how to make these cute cornets. It was a very exciting experience as it was the first time I made such cutely shaped bread! Though the process sounds very lengthy, I found that it was pretty simple to follow. I thought that the handmade cornet cones were a good project idea to work with the kids. I tried to give a brief pictorial to the best of my ability and time :). However, since I have a bunch of chocolate haters at home, I filled only three cornets with chocolate pudding and the rest were gobbled up with a spicy curry filled in! Take a thick craft paper of 10 cms x 10 cms dimension. (I reused a thick paper grocery bag ) Make a cone and staple the edges. Trim the top of the cone to result in a perfect cone. 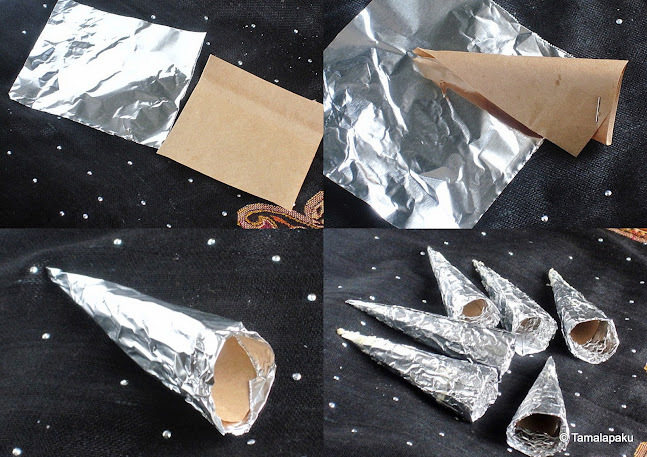 Cover the cone with an aluminium foil and tuck the extra foil into the cone so the foil stays in place. Make the required number of cones and set aside for further use. Soak the Agar Agar strips in 1/4 cup of water for 1/2 hour. Take 1/4 cup of milk and blend in custard powder and cocoa powder. Boil the remaining 3/4 cup of milk and add sugar. Add the custard-cocoa powder mixture to the boiling milk and stir well until the mixture thickens and coats the back of the spoon. Meanwhile boil the the soaked agar agar and water until the strands are melted, water is clear and a jelly like texture shows up on the sides. Add this agar agar mixture to the boiling custard and mix well so there are no lumps. Remove from fire and cover with a cling wrap to avoid a thin layer to form on the custard. Make sure the cling wrap touches the custard else steam will play a spoil sport! In a small bowl, add yeast to the lukewarm water and set aside in a warm place for yeast proofing. In a big mixing bowl add Flour, salt, sugar, milk powder. Stir until well combined. Add the proofed yeast, yogurt and water and gradually stir it with a wooden spatula until a sticky dough results. Don't be tempted to add more flour at this time. Go ahead and do the next few steps in a food processor if you have one ! With a tough hand stir the dough with the spatula until a firmer dough results. Trust me the dough gets much more manageable upon kneading. I did this for about 3-4 minutes until it results in a firmer dough. Cut a tablespoon of butter into smaller bits and embed into the dough and work on the dough until an elastic and pliable dough. (About 2-3 minutes). Oil your hands and smoothen the dough to make a ball. Keep it in a well oiled big bowl covered in cling wrap. Set aside in a warm place to enable rising of the dough. Let it rest until the dough doubles. I left it for 1 1/2 hrs. Deflate the dough and divide the dough into 6 equal portions. Roll each portion into a smooth ball and set aside for 5 minutes under cover. Take each ball of dough roll it into a rope of approximately 1 foot in length. Make sure it is wider on one end and thinner in the other end. Grease the prepared cornet cones and wind the dough rope starting at the tip of the cone gradually till the end of the rope. Pinch the ends so the rope stays in place. Work on the rest of the cones and place them on a baking tray, cover them and set them aside for a second rise. Meanwhile preheat the oven to 390 F.
Glaze the cornets with milk and bake in the preheated oven for 12-14 min or until the tops are golden brown. Remove from the oven and place them on a wire rack to cool. Gently remove the bread from the cone mould and set aside for the next step. Transfer the chocolate custard into a piping bag and pipe the custard into each of the bread cone and enjoy!. If you don't have a piping bag like me, Cut a corner of a small ziplock bag, fill in the custard in the bag and squeeze out into the baked bread cones. This is a typical Offering (Prasadam) at our nearby temple where they perform a Community Satyanarayana Puja every month. Traditionally in our families, the prasadam for the puja is usually made with Wheat Rava. I understand that in some families/communities, this variety of prasadam is offered. I love this as it can be made in a jiffy and is a very pleasant one to enjoy! Note that when offering to Lord Satyanarayana, banana slices and chopped coconut are added. Before checking the recipe here is a recap of all the posts of the past week, in case you missed..
For Day 7 of BM #14 here is the recipe for a super easy breezy prasadam. In a heated sauce pan, add ghee and roast the chopped dry fruits and raisins. After they are nearly golden in color, add the wheat flour and fry until the raw smell of the wheat flour turns into a pleasant and mouthwatering aroma (The flour should turn golden brown). Remove from fire, add sugar and cardamom powder and mix well. Check to see what the fellow marathoners are cooking for BM #14. Back in July 2011, I had the pleasure of hosting an 'Only Baked' event. My inbox was flooded with many mouth watering recipes out of which I have baked this Focaccia bread by Jayasri of 'Cooking is Divine'. It has been lying in my drafts for so long and I would have baked this bread so many times over the past few months. Each time this bread comes out perfect and we thoroughly love the texture and taste of this bread! Here it is for Day 6 BM #14. I used a little less than 2 cups of warm water. In a small bowl, add yeast to about 1/2 cup of warm water and set it aside for the yeast to froth up. Meanwhile, mix in salt, sugar, garlic-chilli paste, basil, oregano, coriander leaves and parsley in the bread flour. When the dough is soft and pliable, make a smooth ball and set it aside for fermenting in a well oiled bowl. Also take care to cover the bowl with a cling wrap. I usually place it in the oven with the light on for extra warmth (sometimes much needed warmth!). After the dough is doubled, transfer the dough onto a deep baking dish (I used 8 X 6 X 1.5 glass dish once and a 9 inch round pan a few times) which has been greased. Make dimples on the spread out dough and arrange the desired toppings in any pattern you prefer. Cover the dish and set it aside for a second rise for about 20-30 min. Sprinkle some more Italian herbs. Bake for about 20-25 min or until it is golden brown in color and the toothpick inserted comes out clean. Remove and cool it on a wire rack and enjoy! I have always trying to make an oatmeal bar but somehow always ended up making cookies. This time around I made sure I baked these bars. In a small bowl, soak the flax seed meal in warm water and set aside. Preheat the oven to 350 F. Prepare a 9 x 9 pan by greasing it. In a mixing bowl, add the oats, nuts, dried fruits and seeds. Whisk the flax seed mixture well until it is gooey and add brown sugar and soy milk and whisk well. Add this wet mixture to the oats, mix well and pat the mixture into the greased baking pan. Make sure the mixture is patted down to about 3/4 inch. Bake it for 45-50 min and remove. Slice it as per requirement upon cooling. Here is a delightful cake which came out real fluffy and mildly sweet, perfect for our taste. I tried to make it vegan but I didn't have soy yogurt on hand and moreover I wanted to try yogurt as an egg-replacer. Enjoy the berry cake for Day 4 of BM #14. More Berries and Brown Sugar as needed to spread on the baking pan. Preheat the oven to 350 F. Prepare a baking pan by greasing it. Spread the sliced strawberries and blueberries (don't slice the blueberries) on the greased pan and sprinkle brown sugar as needed. In a mixing bowl, whisk the flours, cornstarch, baking powder and baking soda. Toss the berries in the flour and keep aside. Blend banana, oil, yogurt and sugar and slowly add it to the flour mixture and gently mix it so there are no lumps. Pour it onto the prepared pan and bake in the center rack for 45-47 min or until the tester inserted comes out clean. Remove from the oven and let it cool in the pan for 10-15 min. Run a knife around the cake to loosen the edges and invert onto a wire rack to cool. Slice and enjoy upon cooling. Makes an 8 inch round cake. My little one was literally pleading and crying for a chocolate cup cake and I knew that I have to give them to her if I care for my peace of mind on a weekday afternoon. I was sure she would not be able to do justice to a full batch of 10-12 cupcakes. So I decided I should experiment with microwave mug cakes. I had bookmarked this a long time back and decided to give it a go as part of Day 3 of BM #14. In a microwave safe coffee mug, whisk flour, sugar, cocoa powder, salt and baking soda. Add in the oil, soy milk, vanilla essence and mix well with a spoon until there are no lumps and the batter is smooth. Now is the time to stir in chocolate chips if using. I divided the batter into 2 small cups. Microwave it in the maximum power setting (Mine is 1000 watt) for a minute and then in 20 sec increments. Insert a toothpick in the center to check if it comes out clean. These cakes were done in about 1 min and 45 sec. Serve them warm and enjoy the delight on the little one's face. Sending to Srivalli's 'MEC- March 2012' hosted by Privish of Killer on the Plate. For the Day 2 of BM #14, I have chosen to share this recipe which is a keeper. The biscottis turned out awesome and a friend who happened to taste this said that they were just like the store bought ones. What else can I say? In a medium sized bowl, mix together flours, sugar, chopped almonds, almond meal, baking soda, baking powder, salt and cinnamon. In a separate bowl, blend together the agave nectar, water,oil, and vanilla extract, then add to dry ingredients and mix well to get a stiff dough. Turn dough onto lightly floured surface or onto a parchment paper. Roll the dough into a log about 12 x 2 x 3/4-inch. Place the log onto baking sheet lined with a parchment paper. Bake 30 minutes; remove from oven and cool for 10 minutes. Cut the log with a serrated knife diagonally into 1/2-inch slices, using a sawing motion. Place slices cut side up, on baking sheet and bake again for 15 minutes. They will get crisper as they cool. Remove onto wire rack to cool. Semiya Laddu And Ugadi Greetings!! Sri Nanadana Nama Samvatsara Subhaakankshalu! !Ugadi Greetings to All!! The second week of this edition of Blogging Marathon is here and you shall see me blog under three different themes. Festival Food - Quick and Easy Mithai, Vegan Friendly Dishes and Eggless Baking with Fruits and Nuts. This recipe qualifies under the first category. My sister's mother-in-law is the source of this recipe which is sure to delight your senses. So here is the recipe for the quick and easy sweet for Day 1 week 2 of BM#14. In a heated wok, add 1/2 tsp of ghee and fry semiya (vermicelli) until golden brown. Remove onto a plate to cool and set aside. Add a few drops of ghee in the same heated wok/kadai and fry the chopped nuts and set aside. Powder the roasted semiya, mix in the fried nuts and sugar. In the same heated wok/kadai, add the remaining ghee and roast the above mixture for a minute. Remove from fire and sprinkle 2 tsp of milk and mix well. The sugar will start to melt and the mixture will come together as a single mass. Pinch bite sized mixture and roll into laddus (small balls) when it is safe to handle with your hands. Set aside for a few minutes to set and is ready to enjoy! I wanted to share my everyday breakfast for a long time now. Since we are talking about whole grains this week, I thought this simple and humble breakfast of mine should be showcased for Day 7 of BM#14. As is evident from the name, this is a quick and easy recipe and can be customized to individual preferences adding whatever flavors one might choose. This happens to be my personal favorite! Note that this can be made on the stove top (just cook on the stove top until done takes about 7-8 min under constant supervision) as well but I choose the easier and faster way. Before the easy-breezy recipe, take a peek at what I have posted for the past week. In a 4 cup microwave bowl, add all the ingredients and microwave on high for 2 min. Remove, stir and microwave for another 2 min in 30 sec intervals, stirring in between. Let it stand in the microwave for a minute and it is ready to be served. Add more warm milk/water to adjust the consistency to your preference. Garnish with more chopped apple and/or grated almond and/or sweetener of your choice. Sending this to "HITS ~Fiber Rich Foods" happening at Spicy Treats and to Srivalli's 'MEC- March 2012' hosted by Privish of Killer on the Plate.